Amazon CEO and founder Jeff Bezos’ riches make him the world’s wealthiest person, ending a 24-year run by Bill Gates the co-founder of Microsoft atop the annual ranking released by Forbes of the 400 richest people in the world. Bezos became the first person on the list to accumulate a fortune of over $100 billion. 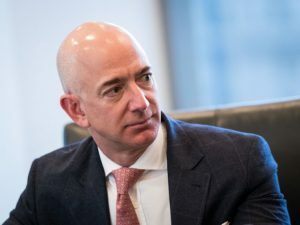 Bezos currently is estimated to have a net worth of $160 billion, up over $75.5 billion for a year ago. The media outlet attributed the jump in net worth by Bezos to the stock price of Amazon soaring over 100% during 2017. Bezos, who this week announced a new minimum wage of $15 per hour for over 300,000 workers in the U.S. at Amazon, pushed Gates to the No. 2 spot on the list. The Microsoft co-founder and philanthropist has a $97 billion net worth. Warren Buffett the owner of Berkshire Hathaway is the third wealthiest with an 88.3 billion net worth, followed by Mark Zuckerberg the founder of Facebook with $61 billion. Larry Ellison from Oracle rounded out the top 5 with a net worth of $58.4 billion. The average net worth for the people on the Forbes 400 increased by over $600 million over the last year, noted Forbes. President Donald Trump this year fell to 259th on the list, with Forbes estimated the president’s net worth at $3.1 billion, which has fallen from $4.5 billion just after Trump launched his bid for the White House back in 2015 when he was ranked as the No. 121 richest person on the list. Forbes called the weakening real estate markets worldwide part of the reason there has been a drop in Trump’s wealth. It blamed some of Trump’s political controversies since being elected, for the Trump brand name becoming somewhat tarnished. Trump remains wealthier than Oprah Winfrey and Ted Turner, but the stalled fortune of the president allowed 27 people to pass him on the list this year. Amongst the biggest winners in this year’s list is Twitter co-founder and CEO Jack Dorsey. The estimated net worth for Dorsey jumped by as much as 186% from last year to $6.3 billion. The largest loser was George Soros whose net worth plunged to just over $8.3 billion from last year’s $23 billion, as the philanthropist moved over $18 billion of his fortune to Open Society Foundations his charity group.